For Halloween, I wanted to decorate our front yard with not just regular ghosts, but Pac-Man ghosts. I adapted Erica Yen's pattern to make them slightly bigger and more proportionally similar to the original 2D sprites. If you'd like to make my version (best shown by the pink and orange ghosts), then download the pattern below! 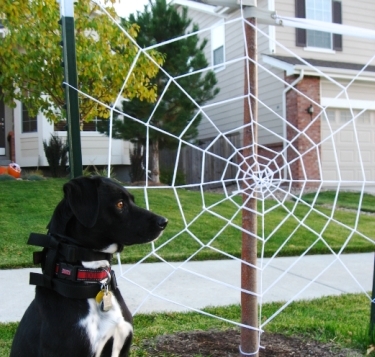 I also followed a great tutorial for a 10-minute giant spider web that doesn't involve any crocheting. I've seen joggers come to a complete standstill in front of it, so it must be effective. Found a fake spider at a thrift store that was added later, but didn't get a picture of it. 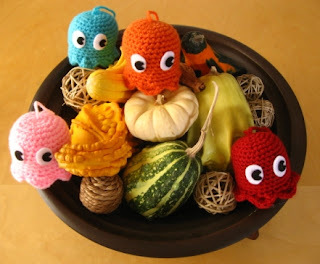 What Halloween or autumn decorations have you put up to decorate your place? So cute! I might have to make these. Thanks for including the pattern.